Everything was set up nicely for the Trail Blazers. After Pat Connaughton scored on a driving reverse layup to open the fourth quarter, Portland led Boston 79-67, and the injury-riddled Celtics seemed ready to be put out of their misery. But NBA games are 48 minutes long, and the Celtics (49-23) took advantage of the last 12 to hand the Blazers one of their most painful defeats of the season. The Celtics outscored Portland 38-23 in the fourth quarter to steal a 105-100 verdict Friday night at Moda Center, an outcome that could have an effect on where the Blazers finish in the Western Conference standings. The Blazers (44-28) head into Sunday's showdown at Oklahoma City (44-30) a game ahead of the Thunder in the battle for third place in the West. And there are other contenders looming close by. New Orleans and San Antonio (43-30) are both 1 1/2 games back of Portland, with sixth-place Minnesota (42-31) 2 1/2 games behind. That's how close it is as teams head down the home stretch of the regular season. A victory would have put the Blazers in a terrific spot heading into their upcoming three-game trip, Now a loss at OKC would leave the Blazers and the Thunder in a virtual tie for third place. "It's a good opportunity to go in there and go up (another) game," said Damian Lillard, who scored 26 points and dished out eight assists. "It's going to be a tough one. Every game to the finish is important." Boston was without its starting backcourt of Kyrie Irving and Jaylen Brown, plus sixth man Marcus Smart. And the Celtics have gone all season without small forward Gordon Hayward, who fractured his ankle in the opener. But Boston has grit and still has good players, including small forward Marcus Morris, who bombed in 30 points, including 5 of 6 shots from 3-point range. After Connaughton put the Blazers ahead by 12, the Celtics responded with a 15-4 run, and it was a battle from there. Lillard finished a drive with a left-handed layup to tie it at 96-96 with 1:45 to go, but Jayson Tatum pushed Boston ahead 98-96 on a drive with 1:29 left. When Morris drilled a 3, the Celtics' advantage was 101-96 with 54.8 seconds remaining. The Blazers were in it to the closing seconds. With Boston ahead 103-100, Tatum missed a pull-up jumper, but Al Horford rebounded and fired a pass to Terry Rozier, who was fouled with 3.2 ticks left. His two free throws iced it for the Celtics. Portland's defense, relentless through three quarters, crumbled in a fourth quarter in which the Celtics hit 11 of 17 shots, including 5 of 6 from beyond the arc. "They were forcing us into some tough looks in the first three quarters," Boston coach Brad Stevens said. "In the fourth, we were moving the ball, and we played really well, especially with the game on the line. The execution was really good." Portland, meanwhile, was only 9 for 25 from the field in the fourth quarter, including 1 of 9 from 3-point territory. "After we win each of the first three quarters, we should play well enough defensively to hold them off," Portland coach Terry Stotts said. "Our poor shooting affected that as well." It was a solemn scene in the Portland locker room afterward, as quiet as it has been in some time. That's what happens when you win 18 of 19 games at home. 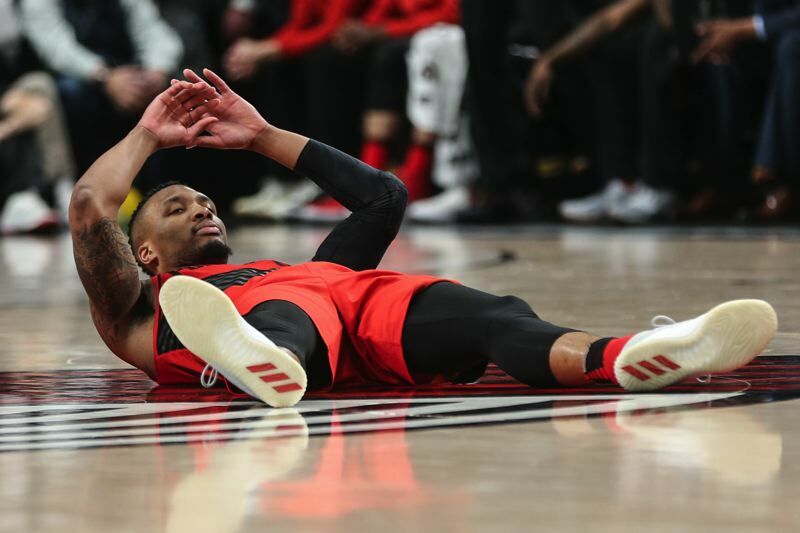 The Blazers, who fell 115-111 to Houston here Tuesday night, have now dropped two in a row in the friendly confines of Moda Center. "We gave up, what, 38 points? That's too many in a fourth quarter against a good team," said CJ McCollum, who had 26 points, seven rebounds and four assists. "You're putting yourselves in a position you don't want to be in. "We're trying to secure the highest seed possible. You can't afford to lose at home very often." Lillard's explanation for the fourth-quarter collapse seemed right on target. "We let our guard down," he said. "We had a good game going defensively. We weren't making a lot of shots, but enough to go along with the way we were defending. "Then in the fourth quarter, they started to make some shots. Their bench got into it, and they got going. They're a good team. You can't give them that life. Once we had them down 10, they got themselves going to start the fourth. They made some tough shots. They were executing. We just let one slip tonight." The Celtics got more open looks in the fourth quarter than they did in the first three quarters combined. "We had some breakdowns that we can't have, some of them my fault," McCollum said. "We have to do a better job communicating down the stretch. If we get stops, it doesn't matter what happens at the offensive end. In the fourth quarter, we didn't get stops." Is the bloom off the rose? After that glorious streak, will the Blazers fall back to earth over the final stretch of the regular season? "Any time you have a streak of 13 games, you did a lot of good things," Lillard observed. "You also need a little bit of luck, for things to go your way. We lost a tough one to Houston. You have to be able to deal with the times it doesn't go in your favor. Every game from here on out is a big game. We gave up 38 in the fourth. You're never going to win a game like that, especially not a close one. "We just have to keep fighting, keep working. We've given ourselves enough of a cushion that we can move on to the next game. It's a loss we didn't want, but it's not the end of the world." NOTES: The Blazers, 3-0 this season against OKC, already own the tiebreaker over the Thunder should they finish the regular season with the same record. ... It was the 17th straight game in which Lillard has scored 20 points or more, the longest streak of his career. ... Al-Farouq Aminu had his fifth straight double-figure scoring game with 16 points on 7-for-12 shooting to go with 10 rebounds and five steals for his seventh double-double of the season. Over the last five games, the 6-9 power forward has averaged 15.0 points, 9.4 rebounds and 2.2 steals while shooting .529 from the field and .515 from 3-point range. "Farouq has been on a good roll," Stotts said. "I was really pleased more with his defense than anything tonight. Horford is a tough matchup, and he defended him well. Farouq is a very important part of what we do at both ends." Added Lillard: "Teams are giving CJ and me a lot of attention in pick-and-rolls. (Aminu) does a great job in transition setting random ball screens, and he's popping out and getting open shots. He's putting it on the floor and doing things off the bounce as well." Portland remains last in the league in assists at 19.4 per game. "I was concerned about it early in the season, but our offense since Jan. 1 has turned around," Stotts said. "I haven't gotten too bogged down about that. What I see on the court is the ball is moving. I don't know if the assists numbers reflect it, but I know the ball is moving better." ... Stotts, on Lillard's impending baby: "It will happen when it happens. That's life. Whenever it comes, we'll support however he wants to handle it." ... Stevens, before the game on the Blazers: "They're a really good team. Terry does a great job. Their organization on both ends of the floor is excellent. You start with how special (Lillard and McCollum) are offensively, but (Moe) Harkless, Aminu and (Evan) Turner shooting the ball has really helped. They have a lot of guys you can go to, a lot of efficient players at the offensive end and versatile players at the defensive end. They've been together so long now that you can tell, they were any minute going to turn the corner. Once they did, they've been playing awfully good basketball."